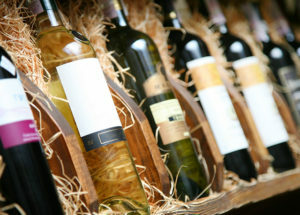 Wine aficionado or not, we all depend on wine labels to help us judge the type, origin, year, and quality of the wine. For this reason, wine labels call for elegant designs, embellishments, and only the best materials. Our team of experienced professionals can help you ensure that your custom printed wine label entices your consumers and never loses quality. Wine bottle labels require high-quality printing, so we use only the best technology at Enterprise Label, Inc. Our printing technologies are capable of four color processing and we can print up to 6 Spot Colors. This means your wine label will stand out with its deep, rich colors! Silk screening and thermal transfer, as well as direct thermal technologies, are perfect for making your wine labels clean, smooth, and top-notch. We can also flawlessly print barcodes on your labels to make your customers’ lives that much easier! Start rebranding your image by contacting us today for your free consultation. When it comes to wine, first impressions are everything, so make yours a good one with our custom printed wine labels!